Miso Crafty Knits: Goodbye Juliet, Hello Shalom! Yesterday I wrote that I thought maybe the knitting gods were smiling down at me. I think I spoke too soon. That, and maybe I was tempting fate a bit too much. Shortly after I hit the publish button on that post I took a good long, hard look at what I had spent the past few days knitting and realized that I didn't like it whatsoever. Since I've finished knitting all the pieces for Phinney and now needs to be blocked before I can sew it up and knit the collar, I decided to cast on a new project. 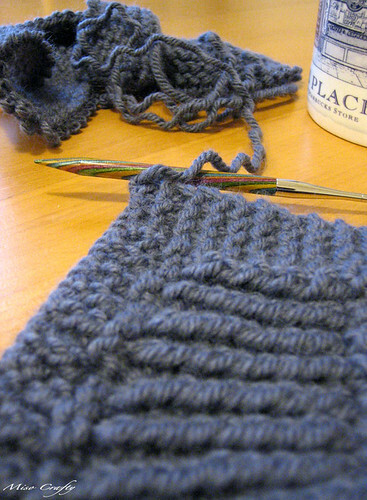 The next on my 12 in 2011 list was Juliet, which was suppose to be a quick, easy and seamless knit. A lot of this was in thanks to the sleeveless and cropped nature of the garment. And the fact that it was to be knit in bulky weight yarn. So I quickly knitted up a gauge swatch, contemplated my needle sizes, then just as quickly cast on the cardigan. I was 10 rows in when I realized that I was screwing up my increases cause I didn't know which side was which, and so when I would put it down to make a cup of tea or something, I would come back and just start doing increases. Yeah, real smart of me. So I ripped it and started all over, this time using stitch markers at the beginning of the row I was increasing on. The entire time I was knitting I was pretty much undecided as to whether or not if I really did like this project. I hemmed and hawed my way to the end of the first section, to the point where you are to try on the garment to check out whether the armholes are ok. While it was still attached to the needles, I tried on Juliet. More thoughts about it raced through my head. Then it hit me. I don't like Juliet. There, I said it. I don't like it one bit. What I did like was how the cardigan looked on the model. But I am in no way a tall, super skinny girl with stick arms and fluffy, wavy hair. And that's what Juliet looked good on. I realized that the reason why I was knitting Juliet was because of that model. I had completely ignored my gut instincts, especially when I thought about how I wasn't a fan of the baby doll look. In bulky weight yarn. On my short body. The entire project just screamed "this isn't you!". And yet I had kept knitting on. But why keep knitting something that you know you just won't like and will most likely never wear? So I jumped onto Ravelry and checked out my possibilities as to what I could do with the yarn I was using and in the small quantity that I had (man, I love Ravelry for that!). Lo and behold, Shalom popped up at the very top of the list. I had completely forgotten all about Shalom and had contemplated the pattern every single time I came across it. The closer I looked at the pattern the more I realized that the style was very me. I had even asked Brett about what he thought about it, and his first comment was "it's very you". With that I say, Goodbye Juliet...Hello Shalom! I knitted Shalom twice. THe first time I used yarn that was too bulky so it was heavy and stretched out of shape. I frogged it and redid it in smaller yarn and I liked it but never wore it so I gave it away. I find I have real problems knitting garments for me. The only other thing I have knit that wasn't a hat or a scarf was my ruby cropped cardi and I never wore that either. It turned out too tight in the arms even when I blocked it. I might try it again and make it bigger. It's hard to motivate yourself to knit a large project when every other time you have they haven't worked out. yeah, on Tuesday, you sounded like me complaining about knitting my mom's shawl - not a good sign when you start a pattern with complaining - way to go with your gut!! It really is hard to motivate yourself when you have yet to have a successful (in your eyes) project. It's easier said than done, but try again!! Yeah...note to self: Don't ignore the gut feeling! !